You really need to see this. PPG has launched a new website dedicated to just color identification for automotive painters called Paint It. Go to http://www.ppgpaintit.com/ and pick a year. Immediately all colors for all cars that year show up in a checkerboard pattern. Then arrange them anyway you like and watch the magic. Limit to vehicle brand, type, color family or any combination you want and the screen will automatically re-sort to your selected options. A lot of work has been put into creating this amazing tool. Even metallic size has been taken into consideration. Add to that interior colors, wheel and accent, under-hood and trim, this site can save painters a lot of time when trying to ID a color. You can even zoom in or out! Each chip then displays color code information, as well as the mix code for PPG. 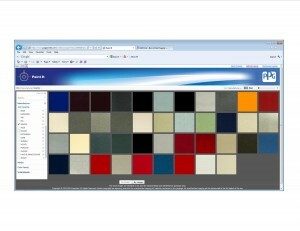 Now of course computer screens can vary in the way they display color, but care has been taken to provide the most accurate representations possible and there is less variation today with thin profile digital screens compared to the old analog versions. Will on-screen color lookup eventually replace color books? The jury is still out on that one, and this tool only goes back to 2009 so far, but time will tell. Whatever has the greatest value to painters will be the survivor.